doi:10.4236/eng.2010.21009 lished Online January 2010 (http://www.SciRP.org/journal/eng/). 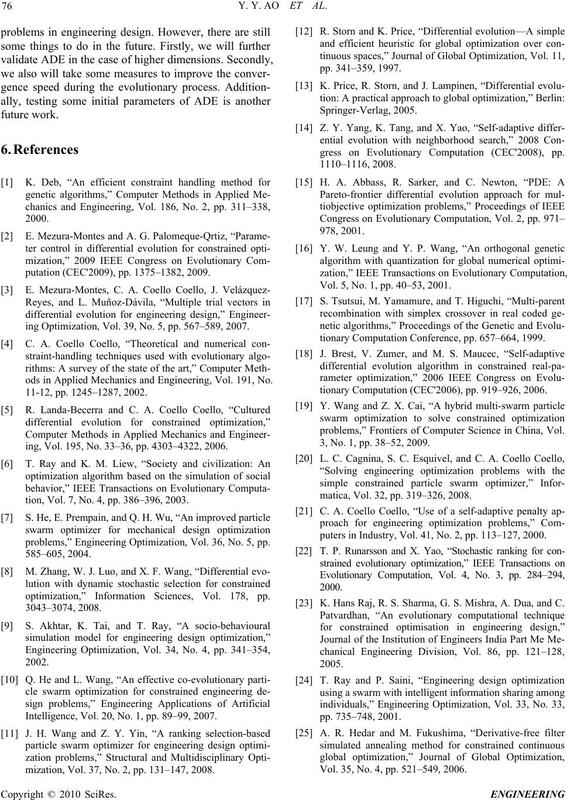 Y. Y. AO ET AL. 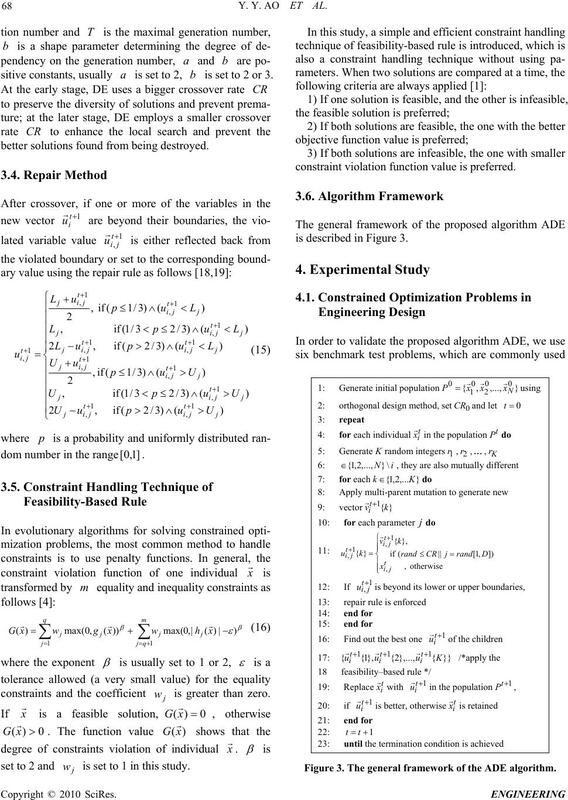 mization for constrained engineering design problems. paths for future research are provided in Section 5.
fication of the differential variation . controls the diversity of the population. scheme DE/rand/1/bin is described in Figure 1 .
each is regarded as one factor of orthogonal design. parent mutation is described in the following. 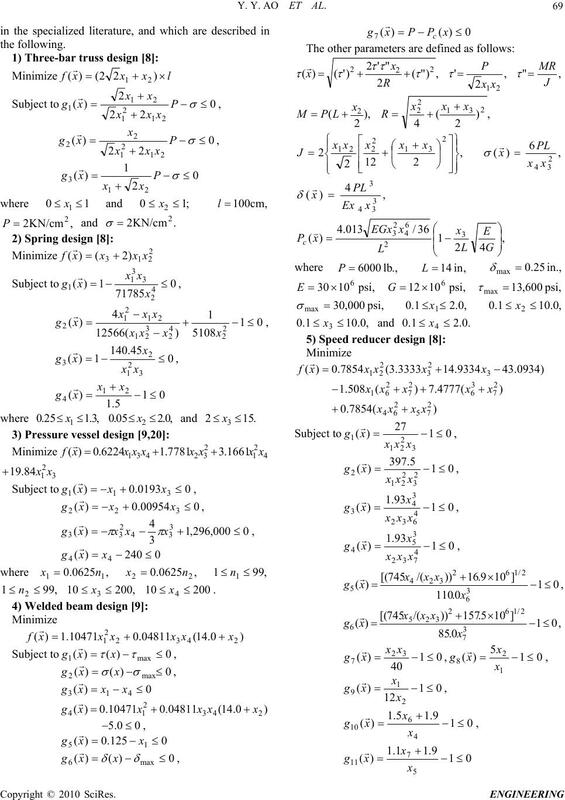 sive constants, usually a is set to 2, b is set to 2 or 3.
better solutions found from being destroyed. w is greater than zero. w is set to 1 in this study. constraint violation function value is preferred. is described in Figure 3. Figure 3. 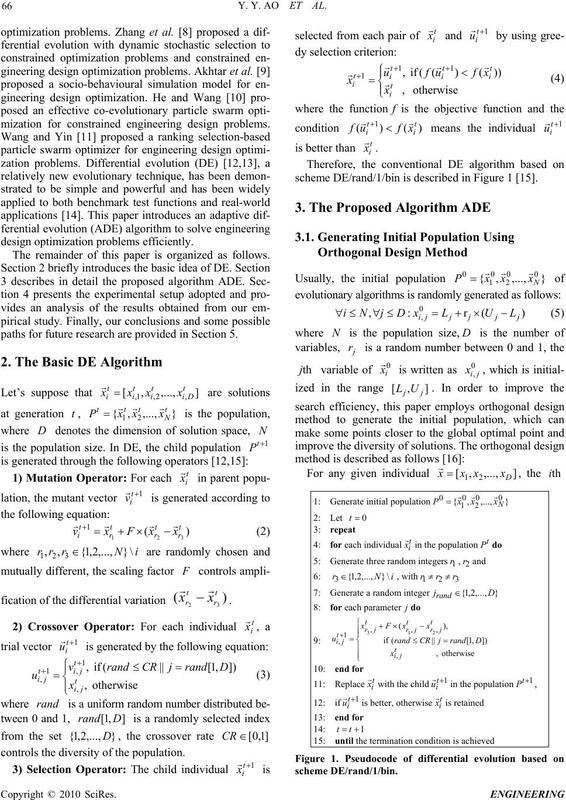 The general framework of the ADE algorithm. ,9.3 0.57 x9.2 6 x.5 5. Figure 5. Convergence graph for spring design. Figure 6. Convergence graph for pressure vessel design. the number of fitness function evaluations. Figure 4. Convergence graph for three-bar truss design. Figure 7. Convergence graph for welded beam design. value. 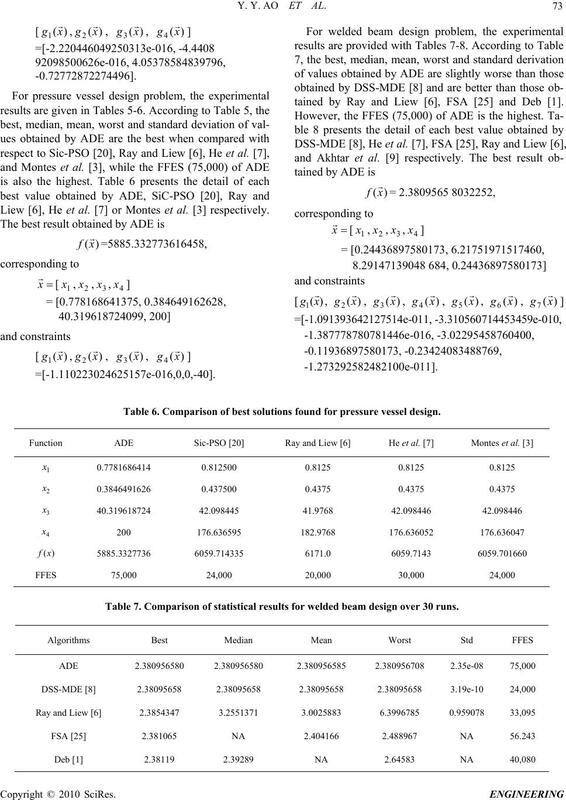 Experimental results are presented in Tables 1-12. And NA is the abbreviation for “Not Available”. found for three-bar truss design. Table 3. 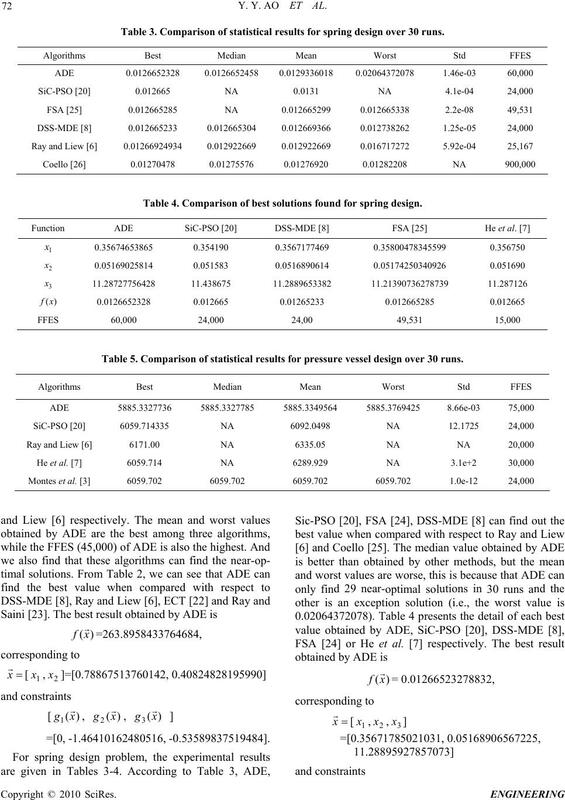 Comparison of statistical results for spring design over 30 runs. Table 4. Comparison of best solutions found for spring design. istical re pressurssel design oveuns. 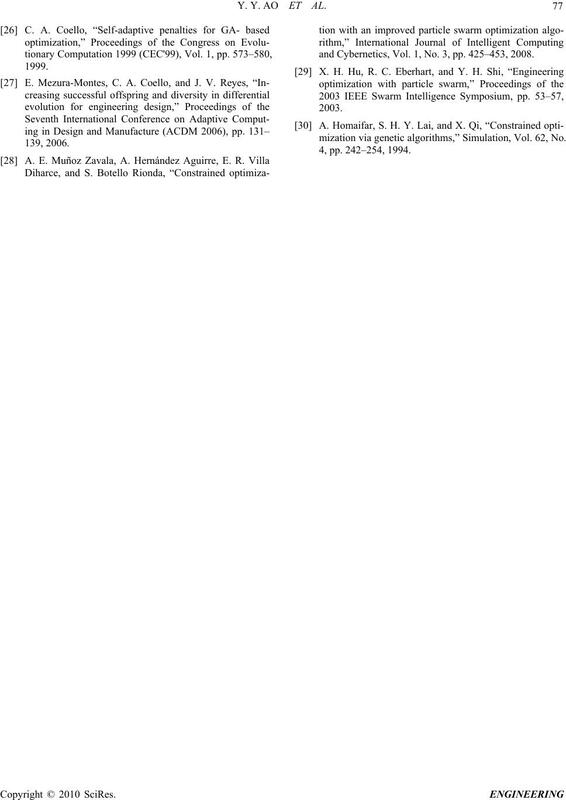 l.  or Montes et al. respectively. tained by Ray and Liew , FSA  and Deb . found for pressure vessel design. beam design over 30 runs. Table 9. Comparison of statistical resultscer desiruns. Table 10. 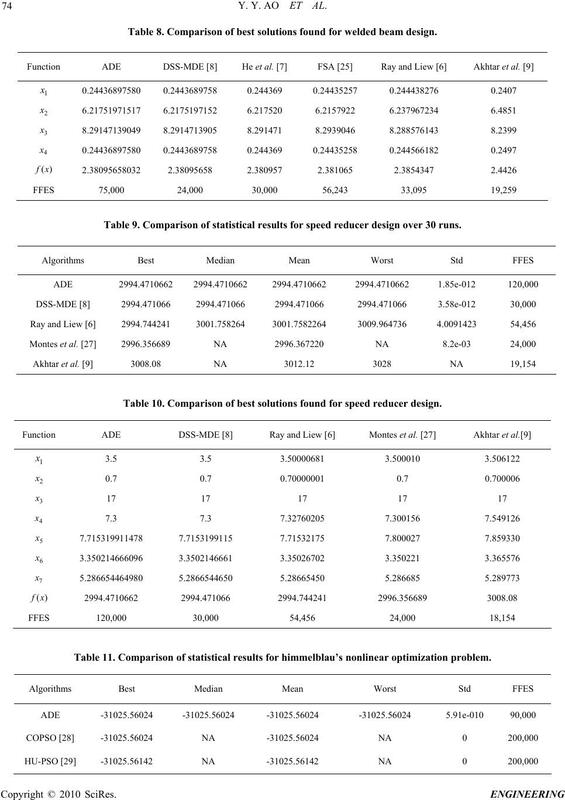 Comparison of best solutions found for speed reducer design. on  iew  tes et al.Aal. Table 12. 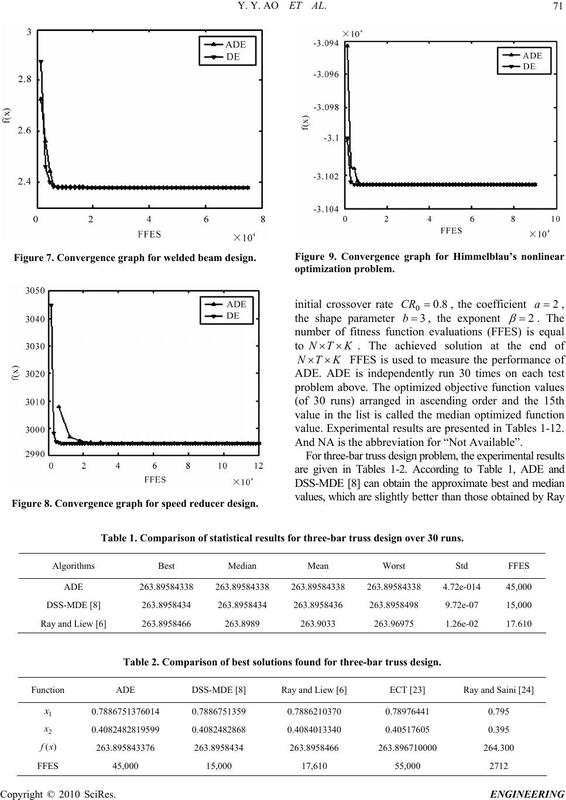 Comparison of best solutions found for himmelblau’s nonlinear optimization problem. 5021466609645, 5.28665446498022] repair rule etc. ing Optimization, Vol. 39, No. 5, pp. 567–589, 2007.
ing, Vol. 195, No. 33–36, pp. 4303–4322, 2006.
tion, Vol. 7, No. 4, pp. 386–396, 2003.
puters in Industry, Vol. 41, No. 2, pp. 113–127, 2000. K. Hans Raj, R. S. Sharma, G. S. Mishra, A. Dua, and C.
Intelligence, Vol. 20, No. 1, pp. 89–99, 2007.
mization, Vol. 37, No. 2, pp. 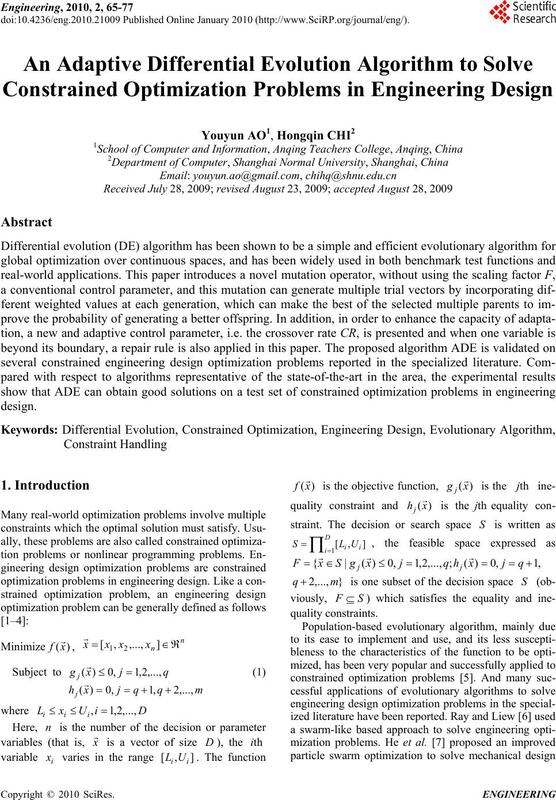 131–147, 2008.
gress on Evolutionary Computation (CEC'2008), pp. Vol. 5, No. 1, pp. 40–53, 2001.
tionary Computation Conference, pp. 657–664, 1999.
tionary Computation (CEC'2006), pp. 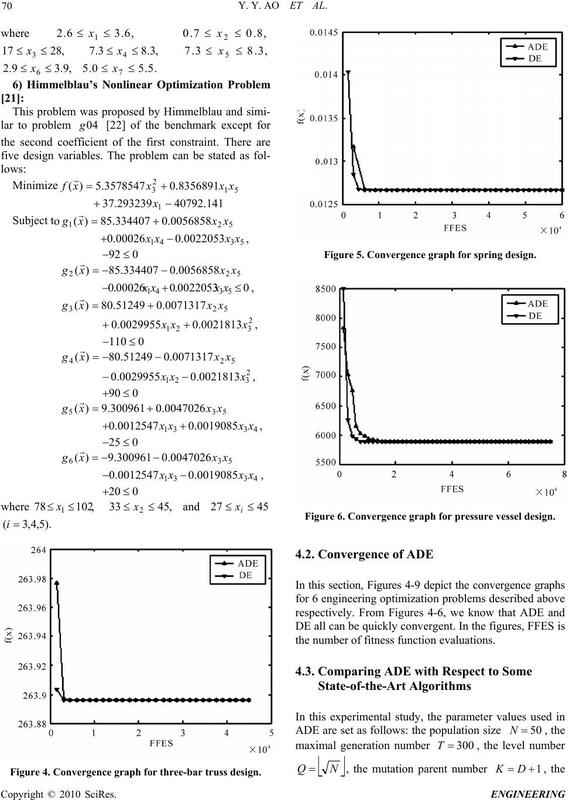 919–926, 2006.
problems,” Frontiers of Computer Science in China, Vol. 3, No. 1, pp. 38–52, 2009. Vol. 35, No. 4, pp. 521–549, 2006.
ybernetics, Vol. 1, No. 3, pp. 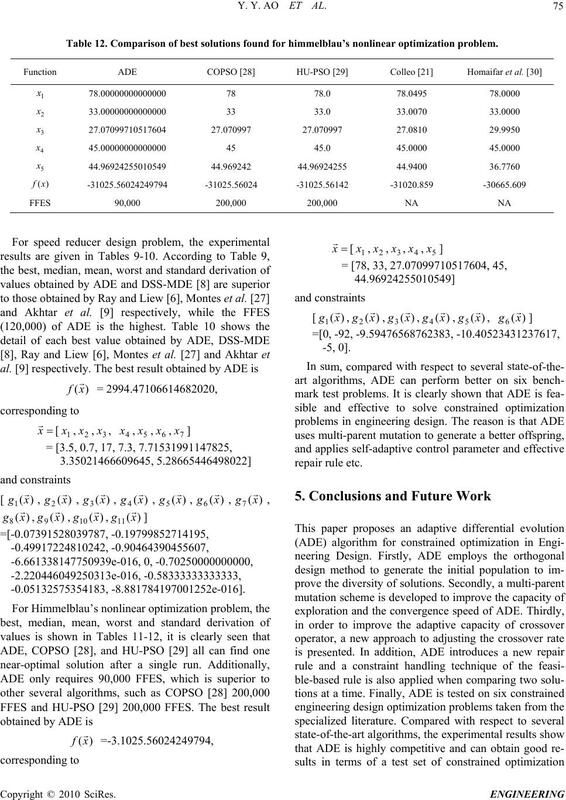 425–453, 2008.
mization via genetic algorithms,” Simulation, Vol. 62, No.